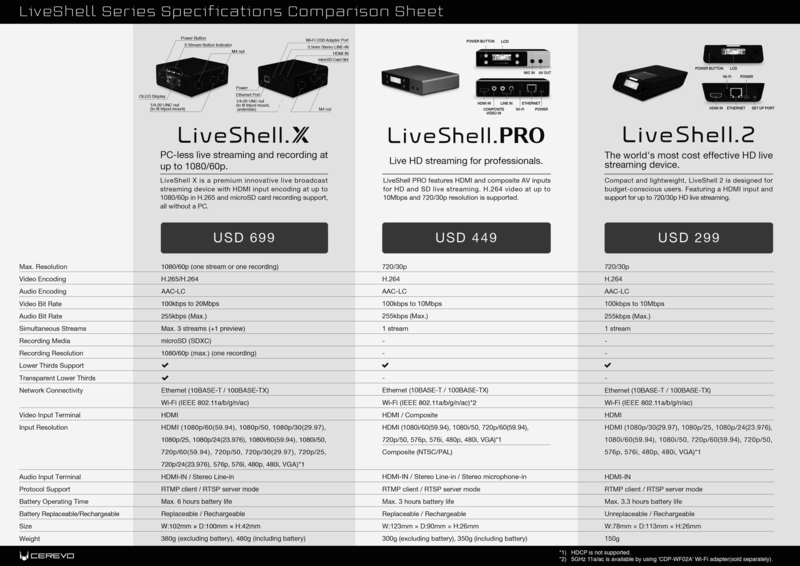 LiveShell Series Product Page | 5 years of live streaming devices refined by video professionals in over 55 countries. years of live streaming devices refined by video professionals in over 80 countries. LiveShell X is a premium innovative live broadcast streaming device with HDMI input encoding at up to 1080/60p in H.265 and microSD card recording support, all without a PC. LiveShell PRO features HDMI and composite AV inputs for HD and SD live streaming. H.264 video at up to 10Mbps and 720/30p resolution is supported. Compact and lightweight, LiveShell 2 is designed for budget-conscious users. Featuring a HDMI input and support for up to 720/30p HD live streaming. * 5GHz 11a/ac is available by using 'CDP-WF02A' Wi-Fi adapter(sold separately) for LiveShell PRO.